The House Committee on Education met twice today and voted on several K-12 related bills. Rep. Douglas House presented HB1552 to establish the Succeed Scholarship Program for students with disabilities who may not be thriving in a traditional public school setting. House said that most children with disabilities are successful with an Individualized Education Program (IEP), but this bill provides a private school option for those whose needs go unmet. Foundation funds would not be used; a separate budget item would be established for the 2016-17 school year. Committee members expressed concern about how the private schools would be held accountable for their use of state funds. Several organizations’ representatives spoke against the bill, citing the lack of specificity on curriculum, staff credentials, and accreditation standards; the potential for abuse of the system; and the fiscal impact on the state. After a lengthy discussion, bill passed unopposed. Rep. Bill Gossage presented HB1583 to broaden the jurisdiction in which school resource officers may issue citations or make arrests. Current law limits resource officers’ authority when traveling with a school group, and any problems must be handled by a nearby law enforcement agency. AAEA supported the bill, with a spokesperson explaining that a student group may have a lengthy wait in an isolated area before police arrive. 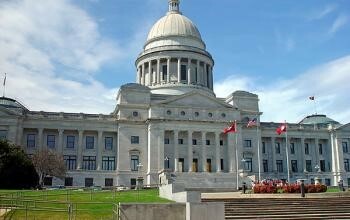 An Arkansas Advocates for Children & Families (AACF) representative opposing the bill said, “This is yet another way to force juvenile courts to deal with school discipline issues.” After extensive discussion, the bill passed. Rep. Charlotte Douglas presented HB1683 to address issues with anonymous bullying through electronic means. The bill provides school districts with a legal avenue to obtain the name on the account used for bullying. HB1683 passed through committee without opposition. Rep. Charlotte Douglas also presented HB1991 to provide a 30-minute, uninterrupted duty-free lunch period for full time classified school employees, except in emergency situations. Employees who miss their duty-free lunch periods will be paid their hourly rate. The bill passed unopposed. Rep. Charles Armstrong presented HB1958 that would direct 2% of national school lunch state categorical funds to grants to support after-school and summer programs. Committee members and organizational representatives discussed whether the bill is at odds with adequacy laws and how other district programs may suffer from the loss of funding. AACF and Arkansas Public Policy Panel representatives spoke for the bill, citing the efficacy of after-school and summer programs and the bill’s alignment with the original intent of NSL funding. Ultimately, the bill failed. The Senate Committee on Education met yesterday after the Senate adjourned, and a sizeable audience waited for the late afternoon discussion of dyslexia policy. Sen. Joyce Elliott presented SB788 aimed at addressing some difficulties school districts have encountered in implementing dyslexia legislation, Act 1294 of 2013. She explained that the bill clarifies the titles, roles, and training requirements for staff; specifies the criteria for instruction; and modifies the makeup of the committee responsible for the Arkansas Dyslexia Resource Guide. Elliott commended the school districts doing a good job with dyslexia programming but said “some have been inexplicably obstructionist” and should be held accountable. Following testimony from various stakeholders, the bill passed without opposition.